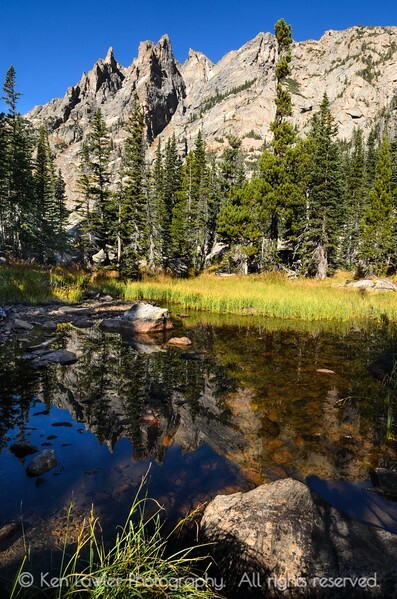 Mountains forming the edge of Emerald Lake are reflected in a quiet nearby pond in Rocky Mountain National Park. Emerald Lake is one of the park's many alpine lakes, rimmed by mountain peaks. The lake feeds a tiny stream which winds its way through the rocks and trees. Perhaps a hundred yards from the lake, the stream pauses on its trip to form this quiet little pond, reflecting the majestic Rocky Mountains and a stand of conifers. I was one of the lucky few to have ventured off the main trail through the marsh grass, to find this hidden lake-in-miniature.